Taste test: These triangular white corn tortilla chips had a small amount of green and red flavor powder visible on them. The chips were extremly crisp and generally fairly curly in shape. 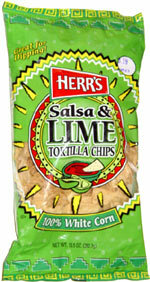 The lime and salsa flavoring on the chips was great, and I couldn't stop eating them. There seemed to be more salsa than lime, and that was fine with me. There was a slightly hot salsa aftertaste too. A great new flavor of tortilla chips! Smell test: Good, but it had just the slightest hint of lime.